Hawthorne Chiropractic has the most knowledgeable and capable practitioners I have ever been treated by. (and I have been to many chiropractors). They not only care about identifying and resolving my issues but also are invested in teaching me to prevent additional and further problems. I can fully and consistently rely on them to give me the best care possible. Our team of providers works together to relieve pain and restore optimal function to your body and mind, going above and beyond traditional one-dimensional chiropractic care and deep tissue massage. Our chiropractors use advanced soft-tissue therapies to treat the underlying cause of structural imbalance and pain, while our massage therapists work simultaneously as chiropractic assistants to create specific and unique treatment plans to targeted areas and creating lasting pain relief and enhanced function. Our acupuncturist works in tandem with the chiropractors, providing tailored orthopedic findings married with their traditional eastern approach. We also recommend custom stretches and exercises to follow up with at home. You are truly cared for with the expertise and thoroughness that our high standards demand at Hawthorne Chiropractic and Healing Arts. Our clinic has gained extensive experience in treating Motor Vehicle Accident injuries, using a tailored combination of Chiropractor-prescribed rehab exercises and soft tissue techniques, Acupuncture, and Massage to gently reduce pain and restore function in a relaxing treatment setting. Our practitioners excel at targeting the root of the problem immediately, shortening recovery time after a car accident or bike accident. As a trusted clinic, we frequently receive professional referrals and ‘nothing-else-has-worked’ patients and we love this! Our team is experienced with difficult, chronic, and complex cases. Our goal is to get you out the door and enjoying life to its fullest. If you need further care, we will happily refer to one of our trusted medical specialists in the Portland area. 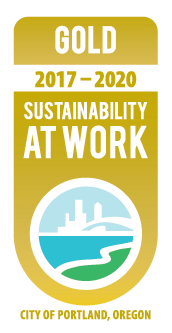 We are also committed to environmental care, receiving our Gold Certification for Sustainability at Work from The City of Portland in 2014.